This text offers a comprehensive overview of new approaches to health-related behaviour from a self-regulation perspective. The authors outline the assumptions on which self-regulation theories are based, discuss recent research and draw out the implications for practice with a particular focus on changing health behaviour. The book is arranged in two sections – Goal Setting and Goal Activation in Health Behaviour and Goal Striving and Goal Persistence. The epilogue compares self-regulation theories with the prevailing social-cognitive models. Denise T.D. de Ridder, Ph.D. is professor of Health Psychology at Utrecht University (The Netherlands) and scientific director of the Dutch Research Institute for Psychology and Health. Her research focuses on topics at the interface of coping and self-regulation with an emphasis on self-care behavior and adherence in chronic illness and eating and overweight in healthy individuals. She is co-editor of Psychology and Health and associate editor of Health Psychology Review. John B.F. de Wit, Ph.D. is associate professor of Social Psychology of Health at Utrecht University (The Netherlands), and executive director of the master program in psychology at Utrecht University. His research interests encompass determinants of health behavior and strategies of change, and combine cognitive, motivational and volitional approaches to self-regulation. He has a longstanding involvement in the domains of sexuality and health, emphasizing the promotion as well as the maintenance of protective behaviors in vulnerable populations. Other work is concerned with motivational processes in risk perception and persuasion. 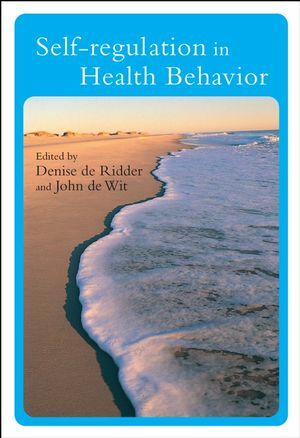 Chapter 1: Self-regulation in Health Behavior: Concepts, Theories, and Central Issues (Denise T.D. de Ridder and John B.F. de Wit). Part I: Goal Setting in Health Behavior: Conflicting Desires and Social Influences. Chapter 2: Contextualizing Health Behaviors: The Role of Personal Goals (Winifred A. Gebhardt). Chapter 3: Unintentional Behavior: A Subrational Approach to Health Risk (Frederick X. Gibbons, Meg Gerrard, Rachel A. Reimer, and Elizabeth A. Pomery). Chapter 4: Social Influences on Adolescent Substance Use: Insights into How Parents and Peers Affect Adolescent’s Smoking and Drinking Behavior (Rutger C.M.E. Engels and Sander M. Bot). Chapter 5: Temperament, Self-regulation, and the Prototype/Willingness Model of Adolescent Health Risk Behavior (Meg Gerrard, Frederick X. Gibbons, Michelle L. Stock, Amy E. Houlihan, and Jennifer L. Dykstra). Part II: Goal Striving to Achieve Outcomes: Getting Started, Staying on Track, and Letting Go. Chapter 6: Implementation Intentions: Strategic Automatization of Goal Striving (Paschal Sheeran, Thomas L. Webb, and Peter M. Gollwitzer). Chapter 7: Managing Immediate Needs in the Pursuit of Health Goals: The Role of Coping in Self-regulation (Denise T.D. de Ridder and Roeline G. Kuijer). Chapter 8: Maintaining Self-control: The Role of Expectancies (Carolien Martijn, Hugo J.E.M. Alberts, and Nanne K. de Vries). Chapter 9: Maintenance of Health Behavior Change: Additional Challenges for Self-regulation Theory, Research, and Practice (John B.F. de Wit). Chapter 10: Hanging On and Letting Go in the Pursuit of Health Goals: Psychological Mechanisms to Cope with a Regulatory Dilemma (Klaus Rothermund).